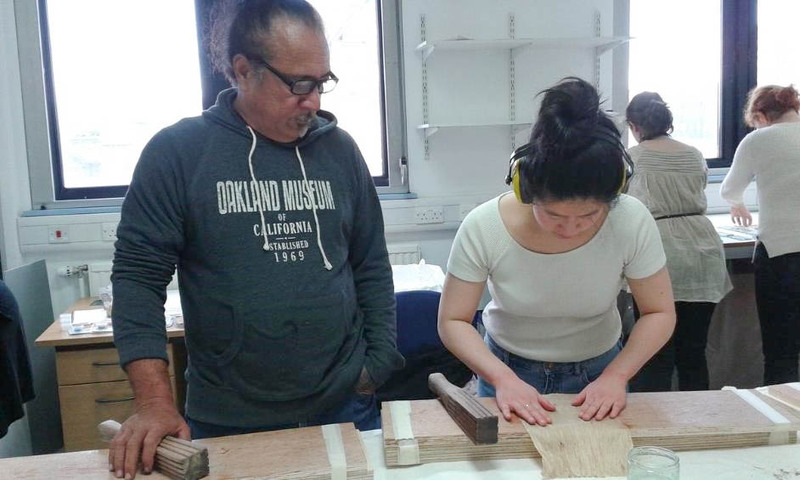 This spring, four students from the CTC assisted with the Conservation of Polynesian Barkcloth & Practical Siapo Barkcloth Making workshop held at the University of Glasgow. 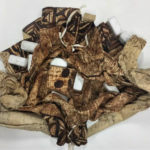 The three-day workshop combined presentations and practical work led by two members of the research project Tapa: Situating Pacific Barkcloth Production in Time and Place, and two practising barkcloth artists and teachers from American Samoa. Research Conservator Misa Tamura and Scientific Associate Dr Margaret Smith led conservation and research sessions, while Reggie Meredith Fitiao and Uilisone Fitiao led sessions on the history, materials, and processes of Siapo (Samoan barkcloth) production. As workshop volunteers, Megan Creamer, Kim Tourret, Eva Catic and Staphany Cheng describe a few of their experiences during the workshop. Over the past two years, I have been one of several generations of CTC students to benefit from the experience of barkcloth conservation and research. Assisting with this workshop was yet another opportunity to learn and participate. The preparation of materials for the practical conservation sessions was something that struck me with particular significance. It was an interesting time to reflect on how much I have learned from Misa and Margaret about conservation and scientific research on the Pacific Barkcloth project. 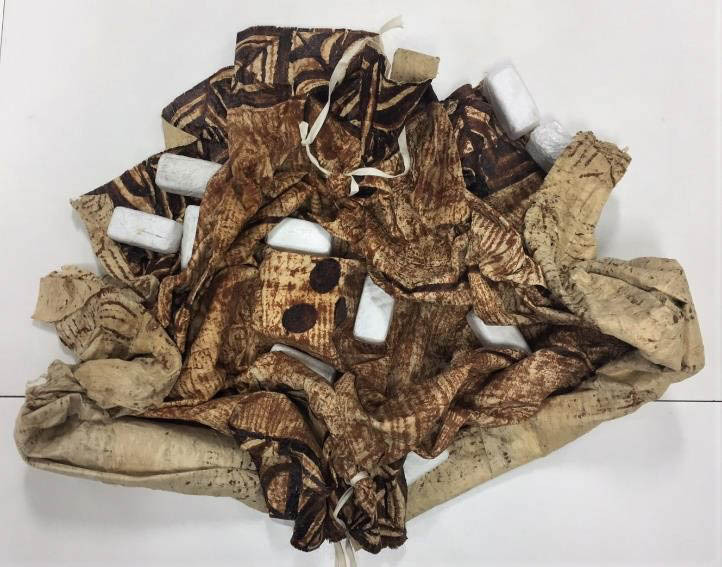 Assembling the conservation materials and supplies highlighted my familiarity with diversity of barkcloth textures, painted surfaces, pigments, adhesives, and degradation patterns from many of the cultures of the Pacific Islands and beyond. Preparing materials such as adhesives, papers, gels, and test samples required precision, quality control, planning, and labelling. 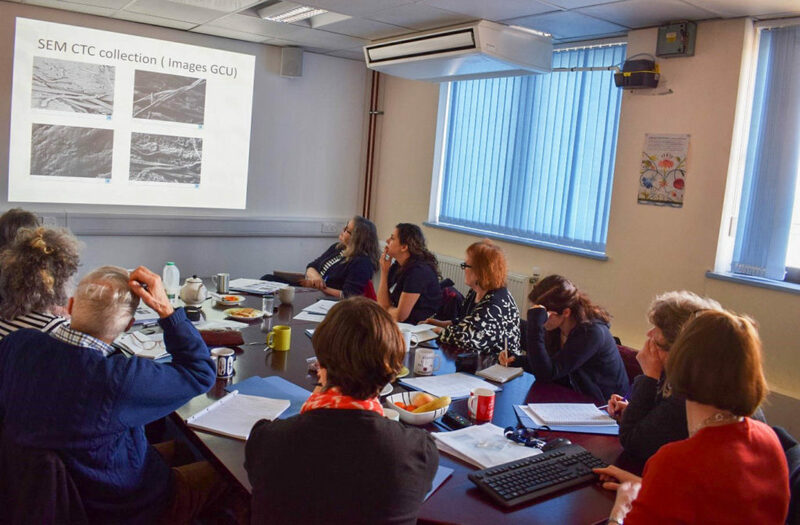 As Misa and Margaret presented during the workshop, I realised how valuable the two years of doing practical and scientific work has been to my time at the CTC. This was all a welcome reminder as I begin planning my own research plan and sample preparation for my upcoming dissertation. We are fortunate enough to have access to a fantastic reference collection with which to experiment at the CTC. Whether testing out different cleaning methods, or trialling adhesive films, using reference collection material that closely resembles the real object in terms of material type and condition allow us to refine our treatments and techniques without harming the real object. 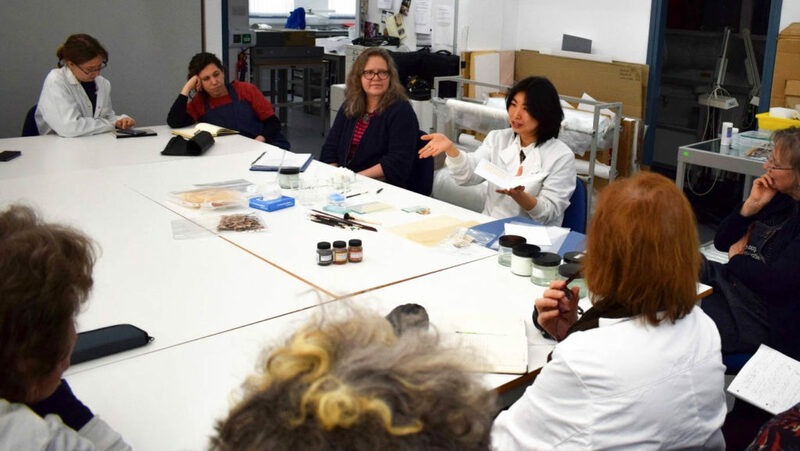 It stands to reason that similar reference samples would be required for the barkcloth workshop to give the participants an experience of the real materials and issues. The artificially distressed barkcloth, awaiting intervention by the workshop attendees.© University of Glasgow, 2018. 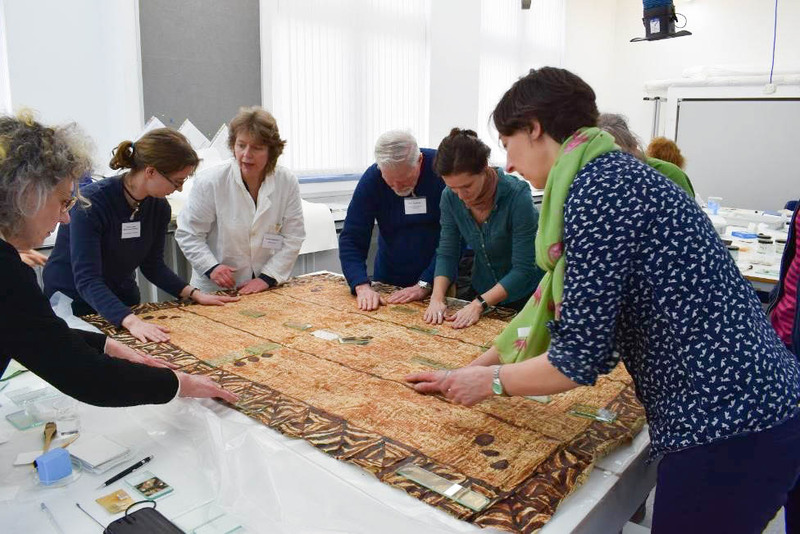 However, it went against all of our conservation instincts when we were presented with a new, beautifully painted barkcloth generously donated by conservator Harriet Stratis for the purpose of testing and teaching. We were asked to artificially distress the barkcloth for use in the workshop by over-humidifying it and creating deep set wrinkles and creases using a variety of weights and ties. As distressing as this was for us, as well as the barkcloth, seeing how effectively it was utilised as a teaching tool for the group made it worthwhile, and highlighted what an advantage having reference samples is to the learning process. It also helped that the workshop did an amazing job treating the barkcloth and undoing all the harm we caused! As a 1st-year student, I started at the CTC during the finishing-phase of conservation programme for the Pacific Barkcloth project. The focus at this time was mainly on making storage mounts and the preparation for the last photo-session, as much of the interventive conservation had been completed. The 1st years had the opportunity to learn some conservation techniques last semester, but I wanted more experience working with these wonderful objects. Therefore, it was especially for me of importance to volunteer for the workshop. Within these three days, we learned every aspect of siapo making, from gaining theoretical background to getting hands-on experience in beating paper mulberry and drawing patterns on barkcloth with Samoan natural dyes. Throughout this three-day adventure, Reggie and Uilisone showed us the magnificence of Siapo-making and its cultural importance in a very animated way. Apart from artistic experience, the workshop also covered methods of interventive treatments. Not only did we learn adhesive treatments with remoistenable Japanese tissue, but also spot cleaning and contact humidification techniques. Overall, I am very grateful to have volunteered during the three days. 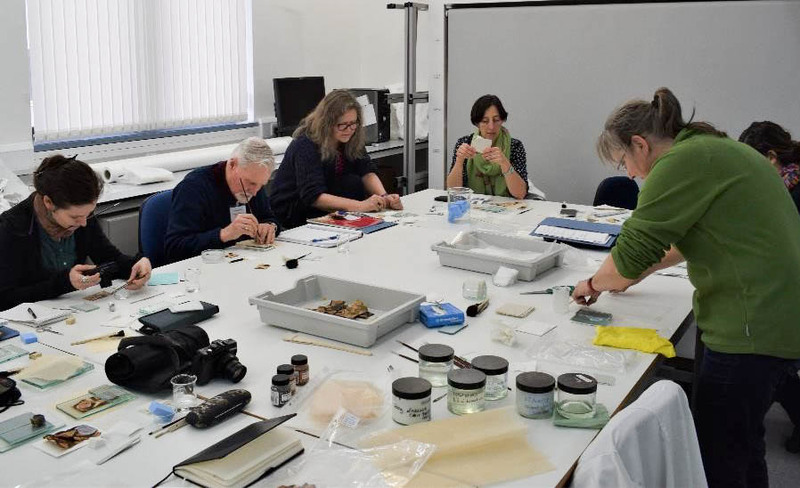 Not only did we had the opportunity to meet experts from various disciplines, we also got a better understanding of the process of making and conserving these amazing objects. 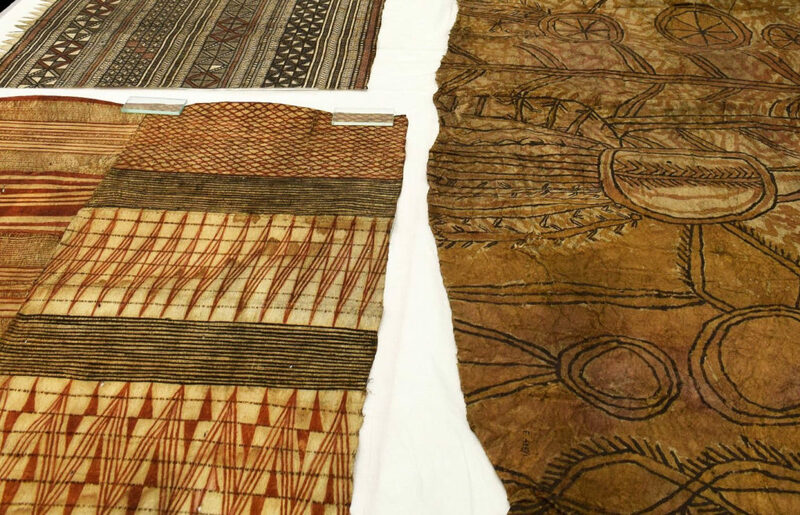 Volunteering for the barkcloth project has given us, as emerging textile conservators, an invaluable insight into the variety of barkcloths that were produced in the Pacific and the conservation issues that are unique to different production processes. Working with Misa on both interventive and preventive processes including humidification, adhesive treatments and rerolling for storage allowed us to experience first-hand how specific characteristics such as the degree of lamination, surface decoration and fringing inform the nature of our conservation treatments. We were able to add another layer of understanding during a siapo making session following the siapo-making workshop for the students at the CTC. Uilisone Fitaio gives Staphany Cheng expert tips on beating Samoan barkcloth from the inner bark of the paper mulberry tree © University of Glasgow, 2018. Learning about the siapo making process with Reggie and Uilisone was magical, cathartic and utterly enjoyable. With less than one hour of beating we each transformed a small piece of paper mulberry bark into a diaphanous, lace-like membrane – think filo pastry thin! Through the repeated application of force, the paper mulberry fibres extended in both lateral and longitudinal direction by almost six times its original dimensions. Reggie and Uilisone demonstrated the different motifs unique to Samoan barkcloth. These traditional motifs represented the flora and fauna that was essential to everyday life. As contemporary artists, they continue to use and adapt these motifs within their current art practice. Learning about these traditional production processes that are still being carried out today, and the stories that they tell was a truly memorable experience. Read more about students, faculty and staff involvement in the Pacific Barkcloth project here.